Percutaneous Nephrolithotomy (PCNL) and Retrograde Intrarenal Surgery (RIRS) are widely used in the management of kidney stones. But the safety and efficiency between these two technologies is still a mystery. This meta-analysis was performed to compare the efficacy as well as safety of Minimally Invasive Percutaneous Procedures (MIPPs) including ultra mini-PCNL, mini-PCNL, and micro-PCNL with RIRS. PubMed, Embase and Scopus were searched, and twelve studies included data on 1207 cases (613 for MIPPs and 594 for RIRS) satisfied the inclusion criteria and were included in this research finally. MIPPs were found to be associated with higher stone-free rate but longer hospital stays, and a larger drop in hemoglobin levels. Difference between MIPPs and RIRS in complication rate, operative time, and total cost were not notable. Given no obvious difference in the complication rate and higher efficacy, our findings suggest that mini-PCNL should be recommended over RIRS for stones>2 cm, and that for stones<2 cm any of MIPPs or RIRS are reasonable. Kidney stones, is the existence of renal calculi that resulted from a disruption in the balance between precipitation and solubility of salts . Kidney stone is a common disease which affects at least 10% of people. And almost 70% of people who suffer kidney stone will have kidney stones recurred . The 2016 guidelines (http://uroweb.org/guideline/urolithiasis/) made by European Association of Urology (EAU) indicates that PCNL should be used as first-line treatment of kidney stones that larger than 2.0 cm, in case PCNL is not an option, RIRS should be used. And for stones smaller than 2.0 cm, PCNL and RIRS are both recommended. There has been a dramatic shift in indications for Percutaneous Nephrolithotomy (PCNL) over the last decade. Some studies indicated that through reducing the tract size, complications associated with percutaneous surgery might be reduced . Miniaturized instruments, including mini-PCNL, micro-PCNL and ultra mini-PCNL, have removed the need to dilate the tract over 20 Fr. In this research, we collectively refer to these miniaturized technologies as Minimally Invasive Percutaneous Procedures (MIPPs). Retrograde Intrarenal Surgery (RIRS) has become increasingly widely used with the advent of technical developments including endoscope miniaturization, enhanced optical quality and tools, improved deflection mechanisms, and the introduction of disposable instruments [4-6]. The EUA guidelines also play emphasis on the appearance of MIPPs, but which technology is better still stay as mystery. The objective of this article was to compare the efficacy as well as safety of MIPPs with RIRS in the therapy of kidney stones through meta-analysis, so that we could provide more supplement materials for the guidelines. Relevant articles were searched in October 2016 and updated in February 2017 using PubMed, Scopus, and Embase without limitation of publication types, regions, or languages. MeSH terms and their related words were also used when searched. The search strategy of PubMed is following: ((((Retrograde Intrarenal Surgery (Title/Abstract)) OR Flexible ureteroscopy (Title/ Abstract)) OR retrograde nephrolithotripsy (Title/Abstract))) AND (((((ultra mini-PCNL (Title/Abstract)) OR mini-PCNL (Title/Abstract)) OR micro-PCNL (Title/Abstract)) OR minimally percutaneous nephrolithotomy (Title/Abstract)) OR micro percutaneous nephrolithotomy (Title/ Abstract)). Related articles were also searched from the reference lists. The complete or the most recent report was used when several passages describing the same population . Preferred Reporting Items for systematic reviews and metaanalysis criteria  was used to guide the article selection. Detailed inclusion criteria included: (1) Participants: single or multiple renal stones. (2) Interventions: MIPPs or RIRS for renal stones. (3) Comparisons: compared MIPPs and RIRS at the same time. (4) Outcomes: the primary outcomes were stone-free rate and complications (Clavien-Dindo grading system  was used to classify the complications). The secondary outcomes were operative time, hemoglobin levels, hospital stays, and total cost. (5) Study design: RCT, retrospective and prospective studies. Exclusion criteria: Studies that only described one of the interventions, animal experimental studies, letters to editor, editorials, reviews, and case reports . Studies involved patients with abnormal renal anatomy (horseshoe, pelvic, and malrotated kidneys, bifid pelvis, ectopic pelvic fusion anomaly) or involved patients with non-opaque stones, and pediatric patients were excluded. Two reviewers (M.Z.L. and H.F.Z.) completed this process, and all disagreement was judged by a senior author (Y.Q.F.). The Oxford Centre for Evidence-based Medicine (http://www.cebm.net/index.aspx?o=5653) was used to judge the level of evidence (LE) for included studies. RCTs were assessed by the modified Jadad scale . Retrospective studies and prospective studies was judged by the adjusted Newcastle-Ottawa Scale (NOS) . Scores range from 0 to 9 for Non RCTs. And non RCTs that achieving six or more points as well as RCTs were thought to be of high quality. Review Manager 5.3 (Cochrane Collaboration, Oxford, UK) was assigned to perform the analysis. Weighted Mean Difference (WMD) was used for analysis continuous parameters, and Odds Ratio (OR) was used for binary Variables. If the continuous data presented as range and means, the methodology described by Hozo  would be used to calculate standard deviations. We used the chi-square test to assess the statistical heterogeneity between studies with significance set at p<0.10, and the I2 statistic was used to assess heterogeneity. Of course, I2=0 means no heterogeneity. I2<30% means low heterogeneity, 30% ≤I2≤ 50% means mediate heterogeneity and I2>50% means high heterogeneity. The random-effects model (DerSimonian-Laird method) worked when there the heterogeneity between articles was obvious (usually we choose random-effects model when I2>50%), otherwise, the fixed-effects (Mantel-Haenszel method) worked. The z-test was used to determine the pooled effects and p<0.05 was considered statistically significant. Analyses in the subgroup were also performed to compare difference PCNL techniques and stone sizes on stone-free rate, operative time, and complication rate. Different grade of complications was also taken into considerations. Sensitivity analyses and publication bias analysis were also performed. Twelve studies including 1207 patients (613 patients for MIPPs and 594 patients for RIRS) meet the inclusion criteria we mentioned above and were included (Figure 1). All studies included were full-text articles. Among all the studies, RIRS was compared with mini-PCNL in six studies [14-19], micro- PCNL in three studies [20-22], ultra-mini PCNL in two studies [23,24], and mixture of mini and micro PCNL in one study . Agreement between the two reviewers was 91.67% for quality assessment of articles. As for the study that both compared micro-PCNL and mini-PCNL with RIRS, we only take it into the overall and stone sizes subgroup analysis, but not for the PCNL devices subgroups (Supplementary Table S1). Figure 1: Flow diagram of studies identified, included, and excluded. Characteristics of trails included in this research are shown in Table 1. All studies excluded Kiremit’s  take age, gender, and stone sizes into considerations, and there is no signification difference between each group. During our research, there were only two small sampled RCTs [16,22] (level of evidence: 2b); eight retrospective studies [14,15,17,19,20,23-25] discussed contemporary series of patients (LE: 3b); three were two prospective studies [18,21], and one of them was matchedpair study  (LE: 2b), and the rest  was prospective data collection (LE: 3b). As for surgical indications, six studies were about mini-PCNL, three studies about micro-PCNL, two about ultra-mini PCNL, and one study discuss mini-PCNL and micro-PCNL at the same time. Among all the studies, five studies aimed at stones that less than two centimeters, two were more than two centimeter, and the rest were mixture of stone sizes. MIPPS: Minimally Invasive Percutaneous Procedures; RIRS: Retrograde Intrarenal Surgery; PCNL: Percutaneous Nephrolithotomy; R: Retrospective; RP: Retrospective Design, Prospective Data Collection; RCT: Randomized Controlled Trail. Table 1. MIPPS versus RIRS: summary of comparative studies. Nine of nonrandomized articles [14,15,17-21,23,24] (NOS: 6 or more of 9 points) were thought to be of high quality, the rest one  was low (NOS: 3 of 9 points) (Supplementary Table S2), and two RCTs were also high quality (Supplementary Table S3). None of the included trails discussed about allocation concealment. Matching criteria in trails were variable expect for one study , which had no declarations. Ten studies [14-22,24] talked about the detail length of followup. Methods for handling missing data were declared in the majority, but not for intention-to-treat. The results of overall analysis were summarized in Table 2. As for the analysis of different grade of complications, difference between MIPPs and RIRS in Grade I or II (OR: 0.79; 95% CI, 0.50, 1.24; P=0.30), and III or senior grades (OR: 0.97; 95% CI, 0.39, 2.41; P=0.95) were no significant (Supplementary Figure S1). No obvious difference was found between MIPPs and RIRS relate to operative time (WMD: -1.97 min; 95% CI, -13.00, 9.06; P=0.73), complication rates (OR: 1.22; 95% CI, 0.62, 2.37; P=0.57) ((Supplementary Figure S2) and total cost (WMD: -$75.89; 95% CI, -209.71, 57.93; P=0.27) (Supplementary Figure S3) and secondary operations (OR: 0.53; 95% CI, 0.27, 1.06; P=0.07) (Supplementary Figure S4); MIPPs was associated with higher stone-free rate (OR: 1.70; 95% CI, 1.23, 2.34; P=0.001), greater drop in hemoglobin levels (WMD: 0.48 g/dl; 95% CI, 0.28, 0.67; p<0.00001) (Supplementary Figure S5), and longer hospital stays (WMD: 0.71 days (d); 95% CI, 0.21, 1.21; p<0.00001) (Supplementary Figure S6). MIPPS: Minimally Invasive Percutaneous Procedures; RIRS: Retrograde Intrarenal Surgery; PCNL: Percutaneous Nephrolithotomy; WMD/OR: Weighted Mean Difference/Odds Ratio; df: Degrees of Freedom; CI: Confidence Interval. Table 2. Results of meta-analysis comparison of MIPPS and RIRS. In the stone sizes subgroup, as for the stone-free rate, difference between MIPPs and RIRS for stones smaller than 2.0 cm was no notable difference (OR: 1.02; 95% CI, 0.64, 1.65; P=0.92) (Supplementary Figure S7). But as for stones bigger than 2.0 cm, MIPPs provide a higher stone-free rate (OR: 4.73; 95% CI, 2.36, 9.47; p<0.0001). As for the operative time, there was no obvious difference between each other (WMD: -7.68 min; 95% CI, -24.81, 9.46, P=0.38) for stones smaller than 2.0 cm (Supplementary Figure S8). And for stones bigger than 2.0 cm, there was significant difference between the two technologies. MIPPs provided a shorter time (WMD: -10.95 min; 95% CI, -14.69, -7.21; p<0.00001). In the PCNL devices subgroups, result for complication rates seemed the same as the overall analysis (Figure 2). Mini-PCNL seemed have a significant higher stone-free rate when (OR: 2.86; 95% CI, 1.73, 4.73; p<0.0001); while micro-PCNL and ultra mini-PCNL had no significant different compared with RIRS for stone-free rate (Figure 3). As for the operative time, mini-PCNL also provided a shorter operative time (WMD: -11.63 min; 95% CI, -14.37, -8.89, p<0.00001) related to RIRS. Ultra mini-PCNL needed a longer operative time (WMD: 21.81 min; 95% CI, 12.24, 31.39, p<0.00001) compared with RIRS. But as for operation time, there was no significant difference (WMD: 15.91 min; 95% CI, -12.80, 44.61, P=0.28) (Figure 4). 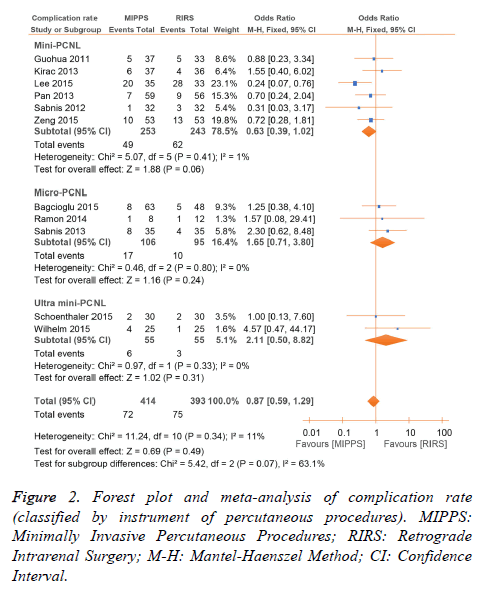 Figure 2: Forest plot and meta-analysis of complication rate (classified by instrument of percutaneous procedures). MIPPS: Minimally Invasive Percutaneous Procedures; RIRS: Retrograde Intrarenal Surgery; M-H: Mantel-Haenszel Method; CI: Confidence Interval. 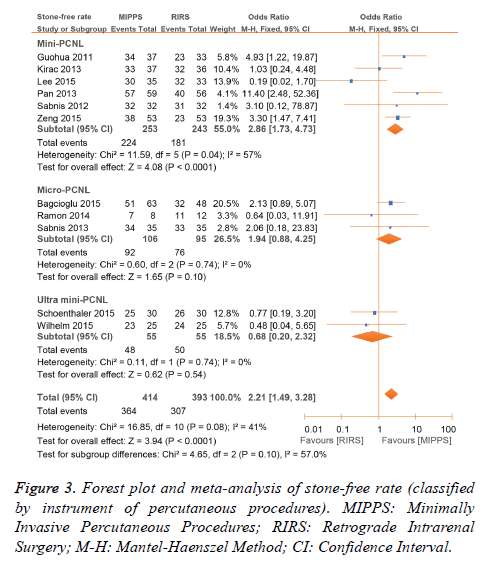 Figure 3: Forest plot and meta-analysis of stone-free rate (classified by instrument of percutaneous procedures). MIPPS: Minimally Invasive Percutaneous Procedures; RIRS: Retrograde Intrarenal Surgery; M-H: Mantel-Haenszel Method; CI: Confidence Interval. Figure 4: Forest plot and meta-analysis of operative time (classified by instruments of percutaneous procedures). MIPPS: Minimally Invasive Percutaneous Procedures; RIRS: Retrograde Intrarenal Surgery; SD; Standard Deviation; IV: Inverse Variance Method; CI: Confidence Interval. Nine nonrandomized and two RCTs trails were included when we performed sensitivity analysis (Table 3). In the present study, no obvious difference was found after sensitivity analysis. The heterogeneity between studies remained obvious. Table 3. Result of sensitivity analysis comparison of MIPPS and RIRS. Figure 5 indicates a funnel plot of the selected studies in this research which reported the stone-free rate. Two studies lie outside the 95% CIs. Other articles lie inside the 95% confidence interval, with an unsymmetrical distribution around the vertical, indication potential publication bias. Figure 5: Funnel plots illustrating meta-analysis of stone-free rate. SE: Standard Error; OR: Odds Ratio. This meta-analysis made up of 10 non-randomized and 2 RCTs articles comparing the efficacy and safety of MIPPs with RIRS included data from 1209 patients. It was shown that MIPPs were more effective than RIRS, with a higher stone-free rate. However, RIRS was safer, with lower decreases in hemoglobin levels and shorter hospital stays. No obvious difference was found in complication rates, total cost, and operative time between the two technologies. Mini-PCNL with ureteroscopy was first described , with the standard mini-PCNL technique being first described . This was followed by the description of micro-PCNL by Bader et al. and ultra mini-PCNL by Desai et al. . The most important change in these instruments is the size of the sheath, but it must be noted that the scale of the procedure may have some limitations on the surgeon’s performance. The overall analysis showed that MIPPs resulted in a higher stone-free rate related to RIRS, a finding that differs from that of a previous meta-analysis . When MIPPs were analysed according to technology type, pooled data showed that mini- PCNL was superior to RIRS, while ultra mini-PCNL and micro-PCNL were not significantly different compared with RIRS. Reasons for this observation may be the experience of the surgeons and the technique itself, whereby stone-free rates may improve with increasing surgeon`s skill and the length of time a technology has been established. However, sheath sizes, stone sizes, surgeon’s habits, work conditions, and tools used may have limitations on the stone-free rate. It is important to consider the complications caused by surgery, and complication rates were compared among pooled studies. In the overall analysis difference between MIPPs and RIRS was no significant, even when analysed by grade of complications and type of MIPPs. And this is quite different from the previous meta-analysis . We could easily find in the Figure 2 that in most micro-PCNL studies, the complication rates were lower than RIRS. While in micro- PCNL group and ultra mini-PCNL groups, it was opposite. This may be because of poor experience of using ultra mini- PCNL and micro-PCNL, alongside the limitation of the sheath size itself. Stone sizes and surgeon’s working conditions may have also contributed to this finding. All in all, the development of PCNL instruments as well as the improvement of hospital care may play important roles in this problem. Operative time is also an important factor for surgeons. Although difference between MIPPs and RIRS in the overall analysis was no significant, we found the time taken to perform mini-PCNL was less than that for RIRS in the subgroup analysis. However, ultra mini-PCNL took longer, and the difference in operative time between micro-PCNL and RIRS was no significant. In the subgroup analysis by stone sizes, we found that MIPPs had a shorter operative time than RIRS for stones>2.0 cm. This may be because larger stones are fragmented to the required size for spontaneous passage rather than removal of fragments by basket catheter. The reasons for this may be the same as those underlying the findings for complication rates. The pooled analysis of the effect on hemoglobin levels showed that RIRS resulted in a lower reduction in hemoglobin levels compared with MIPPs, an observation that was consistent across almost all the studies analysed. This may because of the non-invasive nature of RIRS, whereby the surface and inner normal kidney tissues are undamaged, compared with the more invasive MIPPs techniques. Shorter hospital stays are an advantage of RIRS. All studies expect Wilhelm  indicated that RIRS resulted in shorter hospital stays compared with MIPPs. Again, reasons underlying this may be similar to those proposed for the analysis of hemoglobin levels. Cost of surgery is an important aspect to consider. Only three studies compared costs between the two techniques [14,17,20], and among these studies, no significant difference was found between MIPPs and RIRS. This may be because of medical policies in each country. We also compared the need for secondary operations between MIPPs and RIRS, which might have great influence on the cost of surgery. And we found no significant different between each other. But when we taking stone-free rate into consideration we could find that MIPPs provided higher stone-free rate than RIRS, which means RIRS may have more opportunity for a secondary operation. And this might cost more as the previous study said . All in all, more studies should be performed for detail information. Regarding the stone-free rate, we found the surprising result that difference between the two technologies for stone sizes<2.0 cm was no significant. In practice this may mean that when dealing with stones<2.0 cm, the use of RIRS warrants attention because of its similar efficacy but lower decrease in hemoglobin levels and shorter hospital stays compared with MIPPs. The findings observed in the subgroup analysis of stone sizes support the European Association of Urology guidelines. Although we did not compare traditional PCNL with MIPPs in this study, we observed a great improvement with MIPPs, in contrast to the findings of the previous meta-analysis . Not only the type of PCNL instruments, but also the improvement of hospital care, the surgeons’ skills may have important influence on the results. Taking hemoglobin levels, hospital stays, and other important factors into consideration, it is possible that MIPPs is superior to traditional PCNL, and should be recommended first in patients with kidney stones. To judge the potential influence of study quality on the outcomes, a sensitivity analysis was performed, and only studies of high quality were included. But it seemed little difference was found compared with the overall analysis. Although a research including only RCTs would provide a stronger level of evidence, the very limited number of random control trials stopped us from attaining any firmly conclusions. It is difficult to perform RCTs comparing MIPPs and RIRS because of patient expectations and ethical concerns, that`s why meta-analysis was needed. Between-study heterogeneity was not notable for stone-free rate but was notable for most continuous variable. This may be resulted from the difference in outcome definitions, follow-up imaging, surgical practices, and so on. Using the randomeffects model may have some ability to lessen the influence of heterogeneity, but does not eliminate it. This meta-analysis has some limitations maybe that ought to be considerate. One thing we could not ignore is that the number and sample sizes of RCTs were small. And inadequate random sequence generation increases the risk of bias. So further comparative studies, particularly RCTs are necessary to make definitive recommendations, as most of the included studies had relatively small sample sizes, and the inclusion criteria as well as some definitions of outcomes for these trials were different. Furthermore, the included studies involved surgeons with different levels of surgical expertise, which may have influenced the outcomes. And only a limited number of studies examined ultra-mini-PCNL and micro-PCNL. Devices used at each medical center may vary, including the possibility that they were all referred to as RIRS or MIPPs. Differences in the sizes of instruments may also vary, further affecting our findings. In conclusion, this research shows that MIPPs may be linked with higher stone-free rates, but that RIRS may be associated with a shorter hospital stays and lower decreases in hemoglobin levels. Given the higher efficacy and no notable difference in complication rates, our findings suggest that mini-PCNL should be recommended over RIRS for stones>2 cm, and that for stones<2 cm any of MIPPs or RIRS are reasonable. And in future more RCTs are needed to further explore the results of this research. This study was supported by the Science and Technology Planning Project of Guangzhou (Grant No. 201704020052, to Youqiang Fang). Han H, Segal AM, Seifter JL, Dwyer JT. Nutritional management of kidney stones (Nephrolithiasis). Clin Nutr Res 2015; 4: 137-152. Moe OW. Kidney stones: pathophysiology and medical management. Lancet 2006; 367: 333-344. Ganpule AP, Bhattu AS, Desai M. PCNL in the twenty-first century: role of microperc, miniperc, and ultraminiperc. World J Urol 2015; 33: 235-240. Binbay M, Yuruk E, Akman T, Ozgor F, Seyrek M, Ozkuvanci U, Berberoglu Y, Muslumanoglu AY. Is there a difference in outcomes between digital and fiberoptic flexible ureterorenoscopy procedures? J Endourol 2010; 24: 1929-1934. Humphreys MR, Miller NL, Williams JC, Evan AP, Munch LC, Lingeman JE. A new world revealed: early experience with digital ureteroscopy. J Urol 2008; 179: 970-975. Mitchell S, Havranek E, Patel A. First digital flexible ureterorenoscope: initial experience. J Endourol 2008; 22: 47-50. Mincu RI, Janosi RA, Vinereanu D, Rassaf T, Totzeck M. Preprocedural C-reactive protein predicts outcomes after primary percutaneous coronary intervention in patients with ST-elevation myocardial infarction a systematic meta-analysis. Sci Rep 2017; 7: 41530. Liberati A, Altman DG, Tetzlaff J, Mulrow C, Gotzsche PC, Ioannidis JP, Clarke M, Devereaux PJ, Kleijnen J, Moher D. The PRISMA statement for reporting systematic reviews and meta-analyses of studies that evaluate healthcare interventions: explanation and elaboration. BMJ 2009; 339: 2700. Clavien PA, Barkun J, de Oliveira ML, Vauthey JN, Dindo D, Schulick RD, de Santibanes E, Pekolj J, Slankamenac K, Bassi C, Graf R, Vonlanthen R, Padbury R, Cameron JL, Makuuchi M. The Clavien-Dindo classification of surgical complications: five-year experience. Ann Surg 2009; 250: 187-196. Fan Z, Li M, Chen X, Wang J, Liang X, Wang H, Wang Z, Cheng B, Xia J. Prognostic value of cancer stem cell markers in head and neck squamous cell carcinoma: a meta-analysis. Sci Rep 2017; 7: 43008. Clark HD, Wells GA, Huet C, McAlister FA, Salmi LR, Fergusson D, Laupacis A. Assessing the quality of randomized trials: reliability of the Jadad scale. Control Clin Trials 1999; 20: 448-452. Fan X, Lin T, Xu K, Yin Z, Huang H, Dong W, Huang J. Laparoendoscopic single-site nephrectomy compared with conventional laparoscopic nephrectomy: a systematic review and meta-analysis of comparative studies. Eur Urol 2012; 62: 601-612. Guohua Z, Zanlin M, Wei X, Wenqi W, Wen Z, Wenzhong C. A retrospective study of comparing minimally invasive percutaneous nephrolithotomy and flexible ureteroscopy for lower pole calculi more than 1 cm in diameter. Eur Urol Suppl 2011; 10: 493. Kirac M, Bozkurt OF, Tunc L, Guneri C, Unsal A, Biri H. Comparison of retrograde intrarenal surgery and mini-percutaneous nephrolithotomy in management of lower-pole renal stones with a diameter of smaller than 15 mm. Urolithiasis 2013; 41: 241-246. Lee JW, Park J, Lee SB, Son H, Cho SY, Jeong H. Mini-percutaneous nephrolithotomy vs. retrograde intrarenal surgery for renal stones larger than 10 mm: a prospective randomized controlled trial. Urology 2015; 86: 873-877. Pan J, Chen Q, Xue W, Chen Y, Xia L, Chen H, Huang Y. RIRS versus mPCNL for single renal stone of 2-3 cm: Clinical outcome and cost-effective analysis in Chinese medical setting. Urol Res 2013; 41: 73-78. Sabnis RB, Jagtap J, Mishra S, Desai M. Treating renal calculi 1-2 cm in diameter with minipercutaneous or retrograde intrarenal surgery: a prospective comparative study. BJU Int 2012; 110: 346-349. Zeng G, Zhu W, Li J, Zhao Z, Zeng T, Liu C, Liu Y, Yuan J, Wan SP. The comparison of minimally invasive percutaneous nephrolithotomy and retrograde intrarenal surgery for stones larger than 2 cm in patients with a solitary kidney: a matched-pair analysis. World J Urol 2015; 33: 1159-1164. Bagcioglu M, Demir A, Sulhan H, Karadag MA, Uslu M, Tekdogan UY. Comparison of flexible ureteroscopy and micropercutaneous nephrolithotomy in terms of cost-effectiveness: analysis of 111 procedures. Urolithiasis 2015. Ramon de Fata F, Garcia-Tello A, Andres G, Redondo C, Meilan E, Gimbernat H, Angulo JC. Comparative study of retrograde intrarenal surgery and micropercutaneous nephrolithotomy in the treatment of intermediate-sized kidney stones. Actas Urol Esp 2014; 38: 576-583. Sabnis RB, Ganesamoni R, Doshi A, Ganpule AP, Jagtap J, Desai MR. Micropercutaneous nephrolithotomy (microperc) vs retrograde intrarenal surgery for the management of small renal calculi: A randomized controlled trial. BJU Int 2013; 112: 355-361. Schoenthaler M, Wilhelm K, Hein S, Adams F, Schlager D, Wetterauer U, Hawizy A, Bourdoumis A, Desai J, Miernik A. Ultra-mini PCNL versus flexible ureteroscopy: a matched analysis of treatment costs (endoscopes and disposables) in patients with renal stones 10-20 mm. World J Urol 2015; 33: 1601-1605. Wilhelm K, Hein S, Adams F, Schlager D, Miernik A, Schoenthaler M. Ultra-mini PCNL versus flexible ureteroscopy: a matched analysis of analgesic consumption and treatment-related patient satisfaction in patients with renal stones 10-35 mm. World J Urol 2015; 33: 2131-2136. Kiremit MC, Guven S, Sarica K, Ozturk A, Buldu I, Kafkasli A, Balasar M, Istanbulluoglu O, Horuz R, Cetinel CA, Kandemir A, Albayrak S. Contemporary Management of Medium-Sized (10-20 mm) Renal Stones: A Retrospective Multicenter Observational Study. J Endourol 2015; 29: 838-843. Jackman SV, Docimo SG, Cadeddu JA, Bishoff JT, Kavoussi LR, Jarrett TW. The mini-perc technique: a less invasive alternative to percutaneous nephrolithotomy. World J Urol 1998; 16: 371-374. Lahme S, Bichler KH, Strohmaier WL, Gotz T. Minimally invasive PCNL in patients with renal pelvic and calyceal stones. Eur Urol 2001; 40: 619-624. Bader MJ, Gratzke C, Seitz M, Sharma R, Stief CG, Desai M. The all-seeing needle: initial results of an optical puncture system confirming access in percutaneous nephrolithotomy. Eur Urol 2011; 59: 1054-1059. Desai J, Zeng G, Zhao Z, Zhong W, Chen W, Wu W. A novel technique of ultra-mini-percutaneous nephrolithotomy: introduction and an initial experience for treatment of upper urinary calculi less than 2 cm. Biomed Res Int 2013; 2013: 490793. De S, Autorino R, Kim FJ, Zargar H, Laydner H, Balsamo R, Torricelli FC, Di Palma C, Molina WR, Monga M, De Sio M. Percutaneous nephrolithotomy versus retrograde intrarenal surgery: a systematic review and meta-analysis. Eur Urol 2015; 67: 125-137.